Lafayette, LA — Nov. 13, 2018 — Darnall Sikes Wealth Partners LLC, headquartered in Lafayette, Louisiana, was recognized for its extraordinary achievements throughout the year at the 2018 1st Global National Conference that took place from Nov. 11–13 at the Omni Louisville. 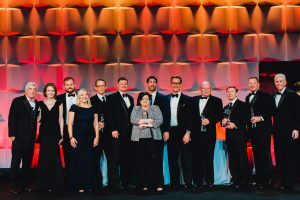 Darnall Sikes Wealth Partners LLC was named an Eight Diamond Eagle, which is awarded to firms based on the criterion of the firm’s production volume across all product lines. Continuing its trend since 2007, Darnall Sikes Wealth Partners LLC was the top-producing wealth management firm in 1st Global’s nationwide network of more than 300 CPA wealth management firms. 1st Global is pleased to congratulate Darnall Sikes Wealth Partners LLC for reaching Eight Diamond Eagle status, deeply appreciates Darnall Sikes Wealth Partners LLC’s devotion to serving its clients through comprehensive financial planning advice and commends Darnall Sikes Wealth Partners LLC on its continued progress and accomplishments. In keeping with the level of excellence demonstrated by Diamond Eagle firms, the theme of 1st Global’s National Conference 2018 was “Redefining Exceptional.” Diamond Eagle firms live out this theme every day in their offices by differentiating themselves in the marketplace, pacesetting firm growth and leading the charge on in delivering an extraordinary client experience. 1st Global enlisted the wisdom of a handful of key speakers to share their experiences and insights on significant trends that drive markets and the significant opportunities created by them. Speakers included Shawn Achor, Harvard researcher and positive psychology expert; Sally Hogshead, “New York Times” bestselling author, researcher and creator of The Fascination Advantage®; Wade D. Pfau, PhD, CFA®, professor of retirement income at The American College and founder of the Retirement Researcher; Robert C. Doll, CFA®, senior portfolio manager and chief equity strategist, Nuveen Asset Management; Jeff Bush, principal of The Washington Update; and Ronald J. Baker, founder of VeraSage Institute. 1st Global was founded in 1992 by CPAs who believe that accounting, tax and estate planning firms are uniquely qualified to provide comprehensive wealth management services to their clients. 1st Global is a research and consulting partner that provides CPA, tax and estate planning firms with the education, technology, business-building framework and client solutions that make these firms leaders in their professions through dedicated professional client relationships built around wealth management. Around 350 firms have chosen to affiliate with 1st Global, making it one of the largest financial services partners for the tax, accounting and legal professions. The Diamond Eagle award is given to firms based on the criterion of the firm’s production volume across all product lines. Securities are offered through 1st Global Capital Corp., which is a Member of FINRA and SIPC and is headquartered at 12750 Merit Dr., Ste. 1200 in Dallas, Texas, 214-294-5000. Investment advisory services are offered through 1st Global Advisors, Inc. Additional information about 1st Global is available at www.1stGlobal.com.